Java bit wise Xor operator operates on bits of numbers. It will be represented as "^". XOR will return true if both bits are different. For example 1 XOR 0 gives 1. Ex: 1^0=1. Program#1:Java Example program on two integer numbers Xor operation. 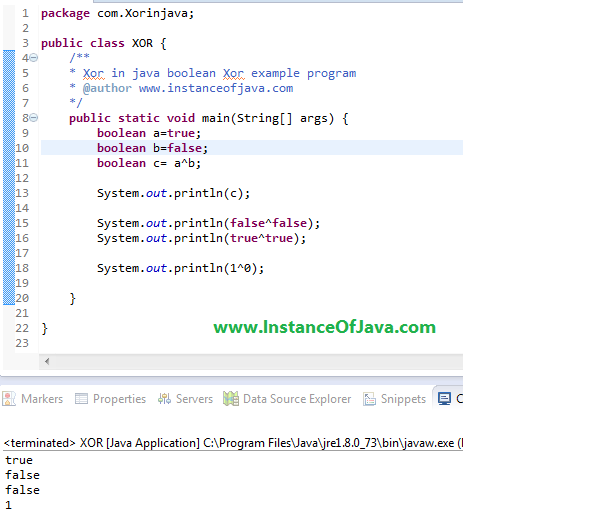 Program #3: java xor boolean expression and integer : java example program Using Eclipse IDE. Program #5: Java xor of two binary strings.